I spent hours behind the wheel of a car today. My schedule sent me to the edge of Alabama for a workshop so I loaded up the college car. The temps were warm today. I worked up a sweat loading the heavy containers of books, handouts, and a cooler filled with ice for refreshments. Out on the highway, I clicked off the AC and rolled down the window. The sleeve of my shirt billowed and flapped like a sail. The wind on the side of my face felt good. Traffic was light so I punched the cruise control button, let the seat back a notch, and enjoyed the ride. Jilda alway packs snacks for me in a cooler bag, so I pulled it into my lap and when there was no traffic ahead or behind, I ventured a look inside. Ah! A banana, Gateraid and a piece of cheese. The top on the drink clicked as it twisted it off and I took a long draw. Peeling the banana, I had my morning snack which helped melt the miles. There were several no-shows for the workshop, but the ones who came were enthusiastic about what I had to say. The ride home was noneventful, except that I ran by the accountant to pick up my taxes. I'd taken them to him over a month ago but he's been slammed. I got the call yesterday that they were ready. He told me that we'd owe a few hundred dollars. Disappointment set in because we'd gotten money back last year and I'd hoped the news would be repeated, but that was not the case. Ah well. This afternoon when I picked up the paperwork, there was a nice surprise. We're getting a refund. I love America. With the change in time, it was still daylight when I got back home. Peeling off my work duds, I pulled on shorts and sneakers. I headed out to get some steps in before Jilda came home from work. The first lap was a blurr but on the second I was more attentive to the changes brought on by spring-like weather. Over on the edge of the garden, I saw the peach tree was blooming. That's not good news because this coming weekend will bring cooler weather. I'm hoping it won't be a killing frost. A gentle breeze out of west swayed the blossoms as I snapped. As a result, when I looked the picture it was blurred. I immediately went to plan b which was to make an "art" photo. I hope Tuesday has been kind to you. When life gives you lemons, make art. I like the blurred blossoms. They look bigger. Im glad your Tax disappointment turned into a surprise. Love how you did the photo. Love your positive and optimist attitude you share in your writing. I hope to read your book this weekend. Im a very slow reader but Ill be in a place where I can enjoy a book and hope the weather keeps warm. I got your book, THANKS! My Sherry grabbed it first. REading smiling, laughing. What is it? YOu will read it, she smiles that, 'I read it first smile'. Our walk is showing the beauty of spring also. Here we get the news of SC peach farmers concern about frost, and in Florida the orange growers worry there also. I'm jealous of your blossoms and your refund! I haven't heard yet if we're getting anything from Uncle Sam...fingers crossed! We've been enjoying mild temps but lots of rain has the Pines about floating away. Have a good rest of this week! I know the feeling when you have to pay the tax man. There was no refunds for me and I had to pay money I wanted to invest instead. It will be the same this year. April 30 is the deadline for filing our taxes here in Canada. It would be wonderful if everyone would show up for your presentation but those who want to be there shows up. That's the way it is. 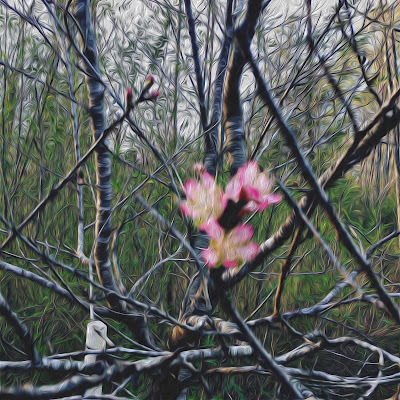 Thanks for sharing your artsy blossom. When you get a refund, that just means that Uncle Sam has been holding your money for you without paying you interest. Peach trees do make the most beautiful blossoms. I grew up near the town of Candor, NC which has many peach orchards. I love to drive by the orchards in March when they are in bloom.